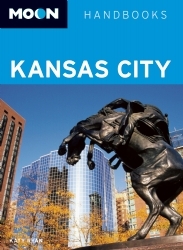 Moon Kansas City, also known as my pride and joy, is a comprehensive Kansas City guidebook that covers it all: shopping, dining, nightlife, arts and leisure, day trips, lodging and more. Planning a quick Kansas City getaway? Relocating from another city? Or are you a KC resident who’s eager for more to explore? Moon Kansas City has something for everyone, whether you’re in search of Kansas City’s best dressed crowd, must-have souvenirs, the perfect plate of barbecue or unmatched architecture. Purchase Moon Kansas City here, or visit Moon.com’s official Kansas City destination site for a sneak peek of what you’ll find inside. For additional information, a partial excerpt of the official Moon Kansas City press release is posted below. To request a review copy or discuss interview opportunities, please contact publicist Eva Zimmerman at Eva.Zimmerman[at]perseusbooks[dot]com. Kansas City has long ruled the Midwest with the fragrant smoke of barbecue and the soothing, simmering sounds of its famed jazz musicians. Dig deeper, however, and you’ll find a growing metropolis home to an eclectic, nationally celebrated arts culture, a rich history, and a friendly and familiar community. In Moon Kansas City, Missouri native Katy Ryan covers the best of the area, including River Market, Crossroads, Westport, Brookside, and Northland. Ryan also provides helpful trip itineraries including “The Best of Kansas City,” and “Top 10 for Kids.” Moon Kansas City also gives travelers useful information on the city’s most notable restaurants, shops, and nightlife hot-spots. Boulevard Brewing Co.: Free brewery tours with complimentary end-of-tour tastings. City Hall Observation Deck: Arguably the greatest view of the city. Money Museum at Federal Reserve Bank: An interactive look at currency and its history. Hallmark Visitors Center: Get a behind-the-scenes peek at the Hallmark cards production process, and grab a Kleenex for a retrospective of their most heart-wrenching commercials. Kaleidoscope: A kid-friendly artistic escape that offers creative activities for the whole family, supplies included. With a bustling, vibrant energy and plenty to do including a wide range of festivals and special events year-round, Kansas City is an ideal place for a weekend getaway—and Moon Kansas City is a great resource to help travelers to experience plenty of the best local flavor and culture.